Includes: If culture is positive, identification will be performed at an additional charge (CPT code(s): 87077 or 87140 or 87143 or 87147 or 87149). Limitations: Test does not differentiate between patient with acute infection or an asymptomatic carrier. Clinical significance: The significance of any isolate in pure or mixed culture must be assessed with respect to the source cultured, the organism's pathogenic potential, the possibility of colonization versus infection, and the number of other organisms recovered in the same culture. This test may be useful in the detection of agents of epiglottis and thrush and a. Haemolyticum. Ask the patient to open their mouth and say “AH”. Gently depress the tongue with a tongue depressor. Guide the swab over the tongue to the posterior pharynx. 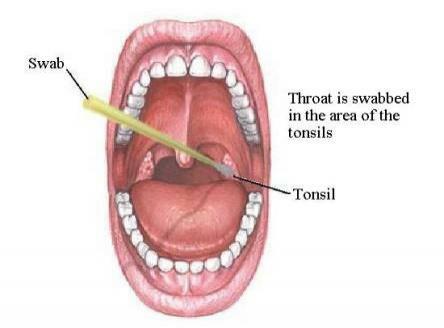 Gently swab the mucosa behind the uvula and between the tonsillar pillars back and forth. Remove the swab without touching the tongue, uvula, or lips. Specimen stability: Deliver to the microbiology lab as soon as possible.